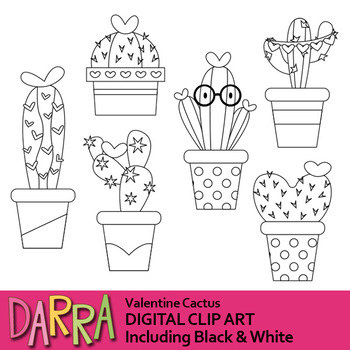 Valentine Cactus Clipart. 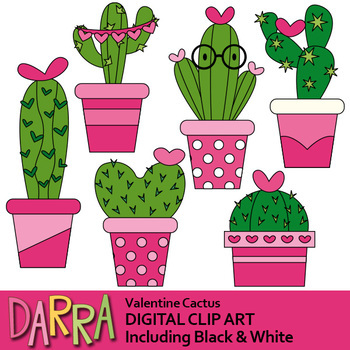 Cute cacti in pink pot clip art. Perfect for Valentine projects such as for posters, bulletin, printed creations, cards, and for more creative works! Small business Commercial use and non-profit/personal license included. For commercial use, you must credit DARRA with a clickable link to my store. Please put credit and link inside your PDF file, on your blog or wherever you display the file. Files must be sold as flattened JPEG or protected PDF files. Teachers must design a decent project to offer free digital download PDF files and must place my clickable link inside the file (you cannot share graphics for free). Please browse my store for more collection.